Warm the wraps up in the microwave for about 20-30 seconds to make them soft and bendable. Halve the avocado, remove the stone and carve thin stripes into it. Scoop the flesh out and add it to a bowl. With a fork mash it to an even mass. Cut the tomato, onion, parsley and garlic finely and add to the avocado. Add the juice of ½ to 1 lime and season to taste with salt and pepper. 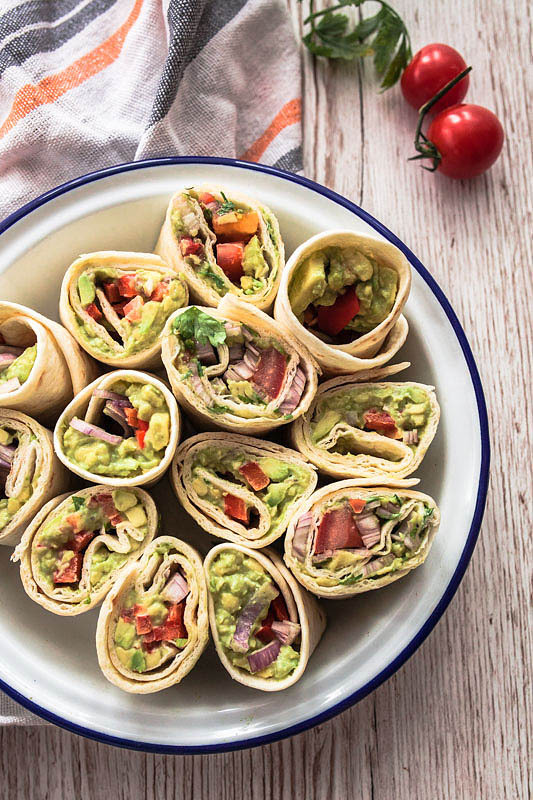 Spread the guacamole on the wrap and roll it tightly (see photos). If desired cut into bite sized pieces or wrap it in foil. Halve the avocado, remove the stone and carve and scoop out. Mash it with a fork and add 1 – 2 tsp of cashew butter to it. Season with salt. Spread it on a wrap and roll it tightly.